I'll just go ahead and say that I received some sad and unexpected news that I'm not entirely sure how to process. So if I start adopting a strange tone, that would be why. Now let me move on to today's post. While reading the Star Wars novelizations, I wasn't sure where I would go next--until I saw that all the old books are now considered non-canon and only the new ones are canon. So that makes it easy: for now, I'll start with the canon books, in published order. 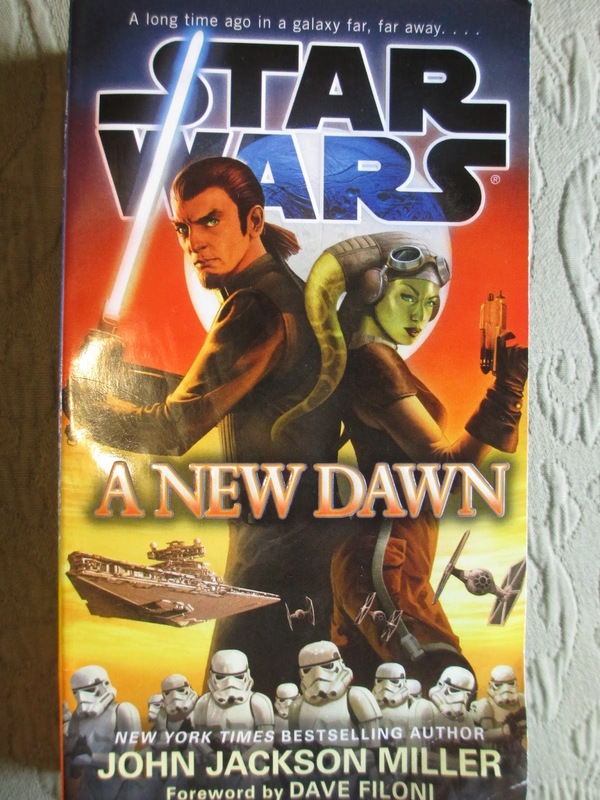 A New Dawn is first; it's something of a prequel to the Star Wars Rebels series. For being a prequel, though, it has much less from the TV show than I might have expected. It's the story of how Hera and Kanan met--but it's slow-moving until they even have a full conversation and the plot keeps running on as if it's leading up to something big. And yet it never seems to reach that something which it's leading up to. 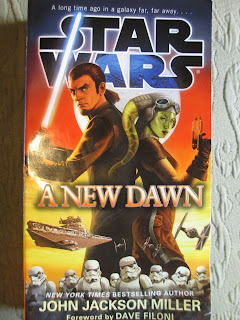 It's the story of one of the Empire's faults against the people, of the beginnings of Hera's quest to start a rebellion against the Empire, and of Kanan's journey from trying to stay out of everything to remembering his place in the world. Which are all good and well; it's just that I wanted a little more resolution at the end: I wanted them to actually have a conversation about the fact that Kanan is a Jedi in hiding. Otherwise it feels too matter of fact that Kanan joins Hera. Maybe a sequel is planned that will fill in the space between A New Dawn and Star Wars Rebels? I did enjoy getting a different look at this universe: a different planet, a different type of characters, even a different type of plot. I also grew rather fond of Zaluna's character: the way that she's so smart and efficient, observing everything, and yet also small, hesitant, and vulnerable. While we're talking about characters, for that matter, Kanan and Hera are both great. Kanan is strangely, like a combination of Luke Skywalker and Han Solo--plus a lot of self-doubt. Hera is bold and quick, courageous and commanding and yet also empathetic and kind: the perfect leader. So while I wouldn't say I loved this book overall, as an extension of the Star Wars universe, I'll take it. Click here for my review of the first box, from Steakhouse 55, and here for the second box, from Blue Bayou. It's been a fun journey, but now I've come to the last of the Diamond Celebration truffle boxes from Disneyland. It's bittersweet--and yet it also feels like like all the thoughts I've given toward these chocolates have now been fulfilled. I have conquered the Disneyland truffles. So. The third box is from Carthay Circle. Given that it's a fairly new restaurant and looks very much like a fine dining restaurant, I've never eaten there. I did the same thing as before and asked the hostess at the front (which is sort of outside of the building, though underneath the roof) about the truffles. She sent me inside to the lounge; I hadn't even known that the restaurant has a lounge. I sat down in one of the chairs and felt a little awkward because I'd left my group outside, thinking that I would be fairly quick (I don't know why I was thinking that). But despite feeling odd that I was alone, I was also delighted to have come into this building. The lounge is fairly big, almost like two rooms, and is decorated in elegant, early 1900's (I believe 1920's, right?) style. Gorgeous. It was kind of thrilling that these truffles gave me the excuse to go in. There was only one waiter taking drink/appetizer orders from everyone in the lounge, so I would say service was on the slow side in general, not just for me. I would probably recommend stopping in for a drink while you're getting your truffles: it takes long enough already that you might as well stay a few minutes longer. It's a lovely place to be in, after all. By the time I had ordered my box of truffles (by the way, this is the only box where you're required to show ID that you're over 21), my group wandered in to wait with me--which was good since this was only about the halfway point in how long I had to wait. Once again, the waiter brought the truffles with the check--and once again I felt like I should leave a small tip even though I wasn't eating or drinking there. But it was strange. I felt like this waiter didn't give me as good of service as I received elsewhere, including from the Carthay Circle hostess. He wasn't rude. But he didn't seem as friendly. And then it seemed to take so long. I decided he must be very busy and therefore could use a tip--I also thought that probably most people who come in just for truffles don't leave a tip and therefore the people who have to go to trouble to give them their box get a little disgruntled that they go through all that without even getting a tip. I guess I'm overthinking everything. Not as happy-looking as the Blue Bayou truffles, the Carthay Circle set looks more similar to Steakhouse 55's group: they both even have one white chocolate, two milk chocolates, and one dark chocolate. Let's begin with the Carthay Manhattan: "Whiskey, Vermouth Angostura Bitters and maraschino cherries." This is dark chocolate with a dark ganache and a shiny purple top. The ganache here is very smooth in texture and the truffle tastes simply of cherries and dark chocolate; it's very good. The alcohol flavor tends to come in more at the end, in the background, or with your second bite; it fits in with the flavors and doesn't feel biting or out of place. A pretty good truffle. Next is the Hazelnut Tiramisu: "Classic Tiramisu with hazelnut." A milk chocolate shell with that slightly darker ganache and bits of hazelnut on top. The primary flavors are warm: milk chocolate, vanilla, light coffee, brown sugar, hazelnut. And yet it isn't overly sweet: there is coolness also to all of those warm flavors. It's a simpler truffle than the Manhattan, but still quite nice. Third is the B52 Coffee: "Grand Marnier, Kahlua, Irish Cream, coffee topped and whipped cream." Another milk chocolate shell holds a dark chocolate ganache has tiny sprinkles of coffee as a garnish. The flavors take half a second to appear and then, wow, they all come in together magnificently. Chocolate (both milky chocolate and rich chocolate), coffee, cream, and vanilla. Is it sweet? A bit. Is it rich? Somewhat. But what it really is is so balanced, everything coming together to create one elegant flavor. It's really good--possibly my favorite out of all three boxes. The case may be that these are simply my flavors; but still I would call this truffle fantastic. And the last one is the Brown Derby: "Bourbon, fresh grapefruit juice and honey." Despite the name, this is the only white chocolate shell, with an accompanying white center and an orange stripe pattern and orange sprinkles on top. I would have called it the prettiest truffle from the box except that it came lopsided: some of the filling leaked and when I cut the chocolate in half, I could see the filling sitting in a partially hollowed shell. That's neither pretty nor detailed. The first flavor is citrus, which quickly narrows into grapefruit and is followed unmistakably by honey and then by white chocolate. Honey also stays as the after taste. So it is the honey that dripped out of the shell; while it's great that they added honey, I do wish it could've been kept more stable. Still, it's definitely an interesting flavor combination and one that I'm finding unique and enjoyable. It's pretty nice. Hands down, this was the best box of the three, just as Blue Bayou's was hands down the worst. All of the truffles in here were good, though some were better than others. This box might even justify its $16.99 price tag. So it would seem that my theory was correct: the quality of the truffles does seem to coincide with the quality of the restaurant. (That is, I've never eaten at Carthay Circle but it looks like it could be better than Steakhouse 55, though I'm certain that both are "better" than Blue Bayou, much as I love Blue Bayou.) So if you get only one box and you simply want the best box (as opposed to wanting to try certain flavors), I would recommend this one. I was a little worried when I heard that you'd need ID for this box: usually chocolates with that much alcohol taste bad. Maybe it's just because those tend to be the cheap chocolates, or because the focus with them is more the fact that they have alcohol than a slightly more complicated flavor profile. But these truffles certainly didn't taste bad; I don't think they even tasted cheap--and they also didn't taste all that much like alcohol. The Carthay Manhattan probably tasted the most alcoholic, possibly followed by the B52 Coffee (although that one's odd because it tastes like Kahlua, which already doesn't taste that much like alcohol itself). Or maybe I can: while reviewing, I was only eating one half of each truffle. So now I have one half of twelve truffles to eat at my leisure--no, I am not sharing with anyone. This was a great idea, Disney. Thanks for the truffles. Maybe make another set for the 70th anniversary please? You know how with certain stories, people complain that the characters got married (either in the end or somewhere in the middle) and that that ruined it? I've been wondering about why people make this complaint: sometimes I think it isn't exactly because they got married that a show or a story had a weak point. So I wonder whether or not it is something else. And then that makes me realize that a lot of the stories I'm referring to are old stories, part of the past, and that maybe if these stories were created today, the characters would definitely not get married (characters almost never get married in stories now--Twilight is one of the major exceptions)--and that maybe that's why people complain. Let me try and be more specific. When I refer to stories, I am mainly thinking of three (because these happen to be the ones I'm familiar with, though there are plenty more): I Dream of Jeannie, Get Smart, and Jane Eyre. Maybe Jane Eyre should be kept separate: the issue there isn't completely the marriage, it's whether or not Jane should have accepted Rochester, which is slightly separate from accepting the idea of marriage. But with the two TV shows, the issue was that it was acceptable for the characters to love each other and to flirt, but the dynamics were ruined once they got married. A TV show has to worry about dynamics in a different way than a book does. The marriage in Get Smart I think was handled pretty well overall. The wedding episode is certainly better than I Dream of Jeannie's, and I think they managed to keep most of the character dynamics intact even though the marriage happened much sooner in GS than in IDOJ. That wedding speaks for it all: it's a hilarious scene in the spirit of the show, with the fighting taking place during breaks while walking down the aisle. That's kind of how it all went from there: domesticity during the breaks from the spy job--it stayed funny. And Max and 99 didn't really act very different toward each other after the wedding than they did before; they just live in the same apartment. I think people get more heated complaining about IDOJ's marriage: they say it ruined the show because, after all, it did happen in the show's fifth and last season. But as I understand it, the show was already on shaky ground during season three, so was it really going to go longer than five seasons, anyway? And then when you look at it in hindsight (as I have done since I only started watching the show 45 years after it first aired), it's in fact rather satisfying to know that all the journeys that these characters went on ended in a marriage. Sure, a couple of the episodes after they got married weren't very good, but so were a couple of episodes before they got married. Think of it this way. IDOJ was very much a fantasy. But sometimes for a fantasy to come full circle, there has to be a stable point at the end. It's like a Shakespeare play, where everyone runs around all crazy in the middle but the play ends with a wedding (or two or ten). It's a formula that only recently has been breaking: movies used to show a clip of a wedding at the end (whenever there was a love story, that is) and now they don't. It isn't considered necessary anymore for two characters to get married in order to solidify the fact that they have fallen in love. But what's wrong if they do get married? Get Smart mostly maintained the character/show dynamics, I Dream of Jeannie's wedding took place at the end of its run, and I can provide a nice and long explanation of why I'm okay with the marriage in Jane Eyre (in terms of character). So instead of ruining each story, I think these marriages helped complete them. Can I just say that the timing of this book is superb? I don't mean in a political sense, or in a socio-political sense, or in a literary or historical sense. I mean in a personal sense--and I don't mean in the sense of my personal journey. I literally mean in the context of timing within my own life. To Kill a Mockingbird was one of the books we read freshman year of high school. Most of the books we read in that class were disappointing: they felt overly simple, like books I could have read in fourth or fifth grade instead or at least spent much less time on because their themes and messages were, frankly, too easy to want to spend any more time on (because, you know, I was around that age where I needed books to challenge me, and these weren't challenging and therefore they were boring and felt like a waste of time). To Kill a Mockingbird was better than probably all of these--but still it somehow became grouped in my mind with them and so I never had much of a personal connection with it or anything much of the deep admiration it supposedly has. But, you know, I wasn't about to resist something as interesting as the situation of Go Set a Watchman. As you all know, this book is what Harper Lee originally gave to publishers--and it became edited and rewritten into To Kill a Mockingbird. So to have that old manuscript suddenly published as a sequel, well, that's just interesting from the point of view of analyzing the situation and the progression of writing style or character treatment or any of that. And of course since I'd decided to read it, I thought it would be best to read it quickly so that I could read it with no other opinions on it than my own. Here is my very brief reaction: I liked it--more than I remember liking To Kill a Mockingbird. That was a book approaching things almost in a Huck Finn way (not exactly, but sort of): the children are just living their lives and looking at things through a child's perspective while greater issues (of which the reader is aware) are surrounding them. 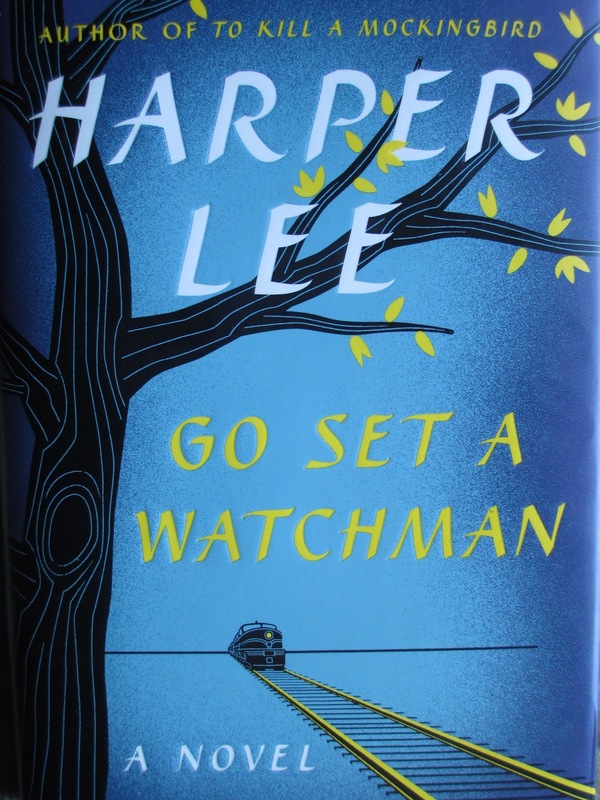 Go Set a Watchman is more along the lines of books from the 1960's, almost like Invisible Man at times (I mean, in the way it approaches certain things or some of the issues it addresses). It's such a stark portrayal of a socio-political situation and its bearing on individuals--and it's also such an interesting look at internal thought processes and the way in which one mind makes its way in the world. As far as format goes, there were quite a few more flashbacks than I had expected, given that this book was marketed as taking place two decades after To Kill a Mockingbird. But I liked the way that the flashbacks were placed with the present day scenes and the way in which random scenes come together to put certain concepts in your mind and drive you toward a certain theme, a certain conclusion, a certain state of awareness. Now here are more details--feel free to skip them if you haven't read the book yet. Click here for my review of the first box, from Steakhouse 55. "Ye come seekin' chocolate and sweet little truffles, eh? Well, ye've come to the proper place. Now sit back and hold on tight, with both hands if ye please." Wait, what? Oh, nothing, just a little playing with a Pirates of the Caribbean quote in celebration of the Blue Bayou and its box of the Diamond Celebration truffles. I do love the Blue Bayou, don't you? I've only eaten there twice, but just the idea of dining inside of a ride is . . . hilarious and yet remarkably serene given the quiet bayou setting. Generally considered Disneyland's finest restaurant (omitting, of course, the members only Club 33), Blue Bayou was the natural choice as the location for one of the boxes of truffles. I bought this box during my first day at the parks. Now, I have a bit of a phobia around aquariums and the like (even the fish tank section at Petsmart gets me a little uncomfortable) and that includes the Submarines at Disneyland: I usually avoid them. So while the rest of my party went on the Submarines, I went by to see if Mr. Toad had a short line (it didn't, so I passed), went instead to the Sleeping Beauty Castle Walk-Through (which closed for the day just a moment after I walked in), and then made my way to the Blue Bayou. I asked at the main counter about the truffles and one of the women there went to bring a waitress. Both of them were friendly and gave good service. Here I waited just inside the door to the waiting around (for people dining there). First I had to wait for the truffles and my receipt and then to get my card back after it was scanned (bringing cash will speed your waiting time). Given my thoughts at Steakhouse 55 on the tip section of the receipt, I find it worth noting that when she brought me the receipt (in the usual black case you get at a restaurant), the waitress told me that she just needed my signature--I took it as a polite way of letting me know that it wasn't necessary to give a tip in this context (I still gave a small one because I was still feeling happy and generous). I was glad, though, that I had come over here without my group: it did, once again, take a few minutes. And yet that's exactly why I felt nicer giving at least a small tip: it seems like everyone kind of has to go out of their way to get you your box of truffles and while that's part of their job, you do feel like they deserve a little something extra for it (although the thought did occur to me that the first woman I spoke to also had to leave her place at the front to get the waitress and yet she probably doesn't get tips). Okay, enough on that. Let's move on to the box, which, as you can see, is exactly the same as the first one. 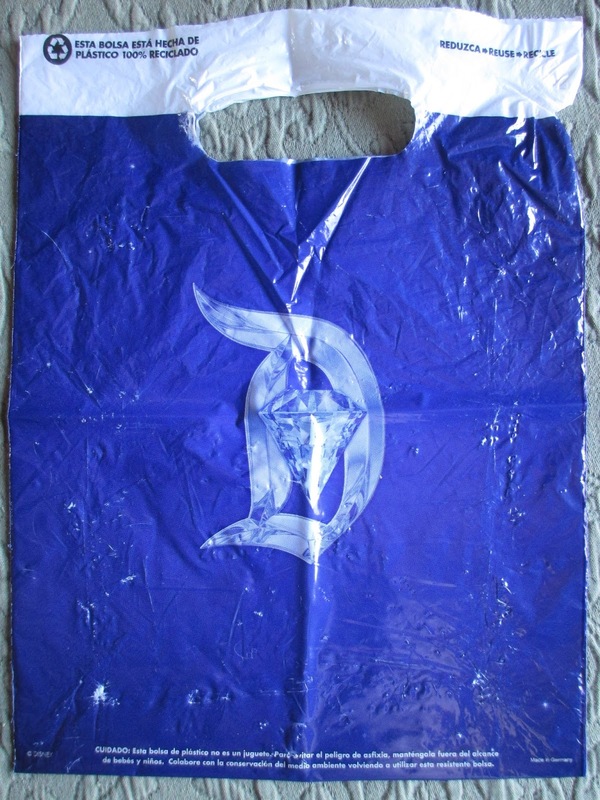 Small and blue with the Diamond Celebration castle. (I stored it away in our Main Street locker with our sweaters for the rest of the day to make sure it would stay safe.) All four of these truffles, however, are milk chocolate, perhaps because milk chocolate was thought to better suit the casual mood of Disneyland? They're also all fairly colorful and happy-looking, which might either speak to the mood of Disneyland or the New Orleans style of the Blue Bayou and its surrounding area. The color palette I like, but the milk chocolate exclusivity I'm not sure about. I'm especially not sure about it because my air conditioning is off (it was almost completely out for a couple of days, too) and so it's a bit difficult to deal with milk chocolate without it melting right away. Let's start with the King Cake truffle: "Confection sugar and lemon juice menthe." It has a slightly darker chocolate ganache and colorful, almost metallic sprinkles on top, making it truly ready for a celebration. I've only had King Cake once and I think it was someone's first attempt at making it, so I really don't know much what it tastes like. Here, however, is what the truffle tastes like: bananas, brown sugar, creaminess, and milk chocolate. It doesn't taste at all like lemon to me, which I certainly don't mind. The banana taste, though, made me wonder if it had perhaps absorbed some of the flavor of the Bananas Foster truffle while sitting in the box. It's a good chocolate, I say with a shrug. Next comes Creme Brule: "Creme, brown sugar and vanilla." Once again, the center looks slightly darker (and also a little more syrupy than with the other truffles); brown sprinkles decorate the top of the shell. I taste the vanilla, yes, and the sugar, too, and just a hint at that caramelized flavor of the dessert that served as inspiration. In fact, it's rather like the dessert (which is rather sweet to begin with), just with a lot of milk chocolate in there, too (although it's a dessert that's often flavored, with anything from chocolate or maple to coffee or berry). Possibly I would say that the milk chocolate is a tad too dominant of a flavor this time, though. Despite being a bit sweeter, I would call this truffle a little nicer than the King Cake one. One of the truffles I was most looking forward to happened to be one of my disappointments, the Mint Julep: "Sugar, lime juice, lemon juice and creme de menthe." Its cream-colored center is fairly free-flowing, and green stripes with a couple of those metallic sprinkles in blue decorate its top. Now, when I'm at Disneyland, one of the snack stops I like is the Mint Julep bar, where you can get a mint julep and a bag of Mickey Mouse beignets--or you can order a mint julep to drink when you eat somewhere like the Blue Bayou. I just think they're pretty and they taste nice and somehow I'm amused by the fact that Disney has turned an alcoholic drink into a non-alcoholic one. So I had a lot of hope for this truffle. It tastes right away like mint, quickly followed by something that turns into lime, then it all tastes a little chalky. About halfway through, the milk chocolate develops as a background flavor. Yes, the truffle does taste a bit like Disney's mint juleps but it also tastes like an Andes mint--and you can get 10 of those for $1 or something like that. So it's an alright chocolate, maybe even nice (Andes mints are good, in their way), but much less than I had hoped for. It would have been better if it didn't taste so chalky and if it were made with dark chocolate instead of milk chocolate (Whoever pairs mint with milk chocolate, anyway? That's rare). Finishing the box off is the Bananas Foster: "Banana, vanilla ice cream, brown sugar, cinnamon, and dark rum." Again, the ganache looks slightly darker than the chocolate; yellow stripes stretch across the surface. This truffle tastes of bananas and more bananas and not much else, even though it has such a long list of flavors. There's some cinnamon in there, and I guess there's also some vanilla. I suppose the definite sweetness counts for the brown sugar; I can taste the milk chocolate. But I'm not getting any rum. So I suppose if you like bananas and chocolate together (and they are an underrepresented pairing in chocolates, if not in desserts), it's nice. I've let myself repeat phrases when describing this box. Everything is nice or good or pretty. Everything is milk chocolate. But nothing really stood out to me and certainly nothing was worth the $16.99 price tag. This is more what I had been initially expecting from this truffle line (before I tried the Steakhouse 55 set and found them just a little bit better): mediocrity. This is the kind of thing I get from Godiva when I have a coupon or they have a sale and I'm just in the mood for some sweet and flavored milk chocolate to munch on. The Steakhouse 55 box was definitely better overall: perhaps its execution was more varied, or more thought out. Or maybe. I'd almost hate to think it, but you know, as much as I love the Blue Bayou Steakhouse 55 is a better restaurant than the Blue Bayou. So maybe the quality of the truffles varies with the quality of the restaurant? I'd hardly call that an excuse--but given the fine dining style of Carthay Circle I do hope their truffles will be better than these. Because if these are just the weaker of the three boxes (and I would be okay with that), that could mean an acceptable overall quality for the Diamond truffles. 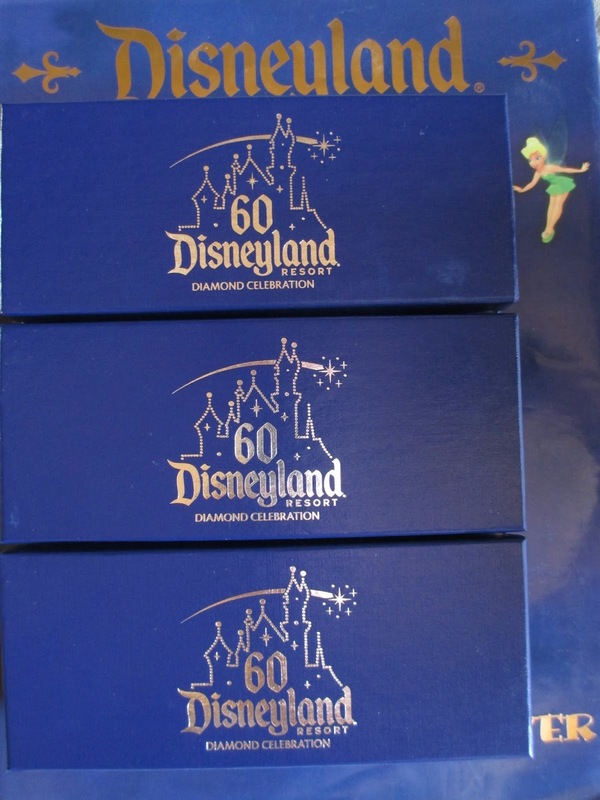 As you all know, I'm probably a little more quick to criticize chocolate than the average Disneyland goer--so while I find some depth lacking in this box, maybe most everyone else will just all them another Diamond Celebration dessert: they're nice little chocolates. Click here for my review of the second box, from Carthay Circle. I thought I would take a moment to share the things I bought at Disneyland. Then I thought also I would give a couple of thoughts on the 60th Anniversary happenings. The castle, for instance, I was not prepared for: I had seen pictures of its crowns and banners, but none of that showed how beautiful it looked in person. It glistened in the sunlight, truly part of the Diamond Celebration: all the little top pieces on the towers catch the sun and twinkle like jewels. I was undecided on whether or not to watch World of Color. Ultimately I decided not to since I was going with a couple of people who'd never been to the parks and I decided I'd rather have them watch Fantasmic than World of Color. We did watch the fireworks twice, though. The first day in front of Small World and the second day at our spot (by the railing) in front of Rivers of America. Okay, they weren't as much a celebration of the park as the 50th fireworks were, but they were nonetheless wonderful. The projections added something extra special, Nemo traveling along Tinker Bell's route was fun, and the snow during "Let It Go" was just . . . wonderful. I've seen snow in Disneyland during December, but I didn't know they had brought it back for summer, too: talk about bringing out your inner child. Now let me go back to my purchases. I feel like I didn't buy much this time--though I in fact bought more than I usually do (except maybe the time I went during my birthday--but I had some birthday money and a gift card that time). I started off with pins. 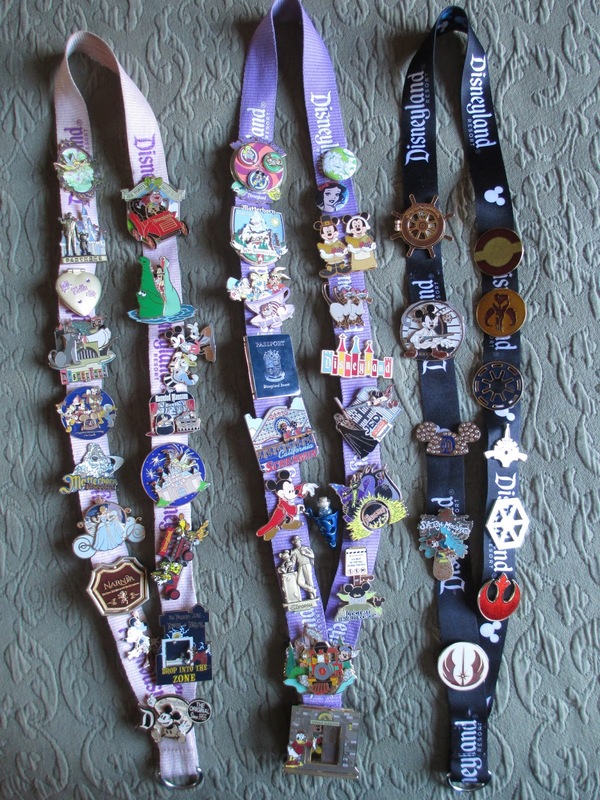 I like to keep my pins on lanyards (as opposed to those binder carriers they sell) so that I can hang them up and see them all the time. I already had two full lanyards, so I bought a new black one. It's already half full. I already bought the seven-piece set of Star Wars symbol pins. I really only wanted the Jedi Order, Rebellion, and Empire ones, but you have to get the set for them, so I did. I also picked out a simple 60th Anniversary pin (a blingy Mickey hat) and a Splash Mountain pin: I'd been needing a Splash pin since it's one of my favorite rides. 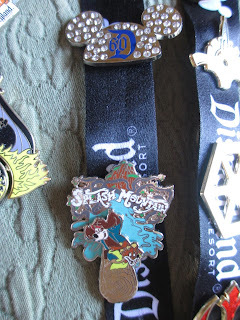 If you're curious, you can see my 50th Anniversary pin fifth down on the left edge there on the pink lanyard. 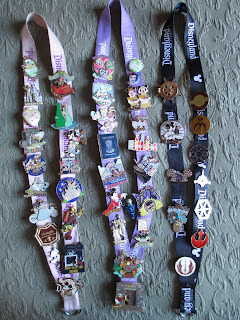 At the parks, I wore the new black lanyard this time, filling it with some new pins and some of my favorites of the other pins. 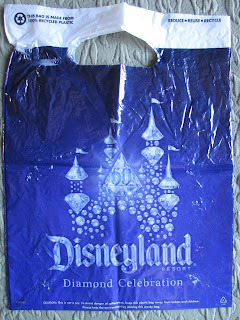 If I remember rightly, I wore the Partners statue, POTC, the blue Tower of Terror, the Crocodile, Mr. Toad, the Teacups, the Matterhorn (maybe), the Storytellers statue, Yoda, Fantastic, the 60th pin, Splash Mountain, and the Rebellion pin. 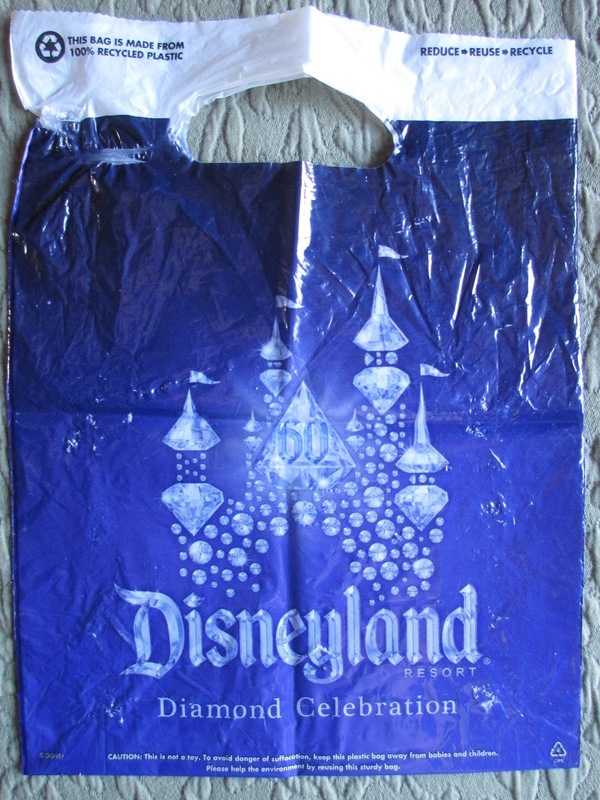 Maybe I wore the Disneyland sign also. For some strange reason, I never took a picture of the lanyard I wore before I put everything back the way it was (I like to keep them on the lanyards in the order that I bought them in). As I've mentioned, I also bought all three boxes of the 60th Anniversary truffles--that's the main place where I emptied my wallet. A couple of years ago, I bought some of the Wonderland tea and really enjoyed it, so I bought a tube of English Breakfast tea this time--and somehow completely forgot that the other tea was loose and this one was just tea bags. I must've been distracted when I was picking it out: given the choice, I always prefer loose tea. And it isn't as good as the tea I got before: it's okay but nothing special and so I guess I only got it for the container. I kept admiring the journal with the 60th Anniversary Diamond Celebration castle on it, all glistening with bling. On the first night at World of Disney, I thought that I would wait until after I'd been in the parks to get it: you know, in case I saw something else in there that I'd rather get. I almost bought it at the Emporium. And then when I went back to World of Disney the day after the parks, I still didn't get it (I don't know why: I love notebooks and it was like a little bit of history). 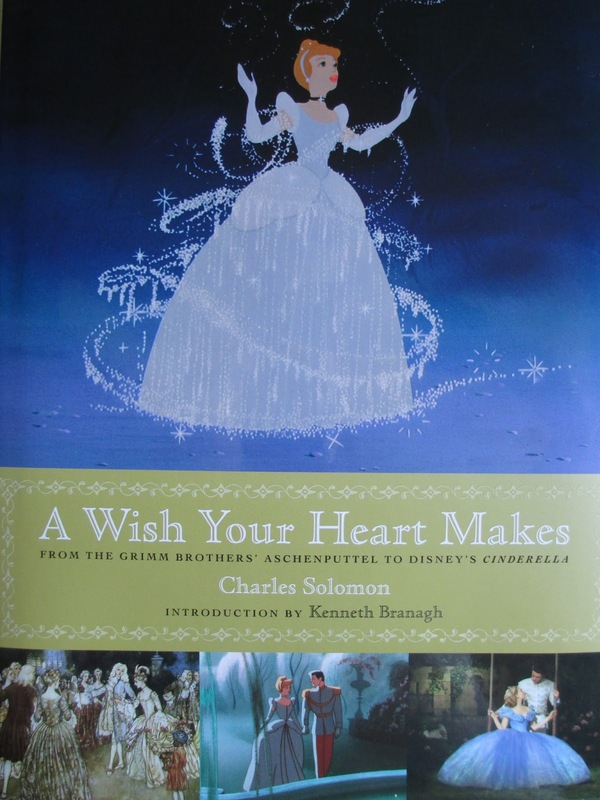 Instead I got this book about the making of Cinderella. It's a lovely book and I'm looking forward to reading it, but I'm not sure I should have spent the money on it (especially since I didn't spend it on the journal I kept stalking--which was half the price of this book). And then because I'm crazy, here is a picture of the bags the stores are using right now. That's the bling castle that was on the notebook I liked. And I suppose I'd better stop showing pictures now before I start putting up a picture of the park maps and the napkins. 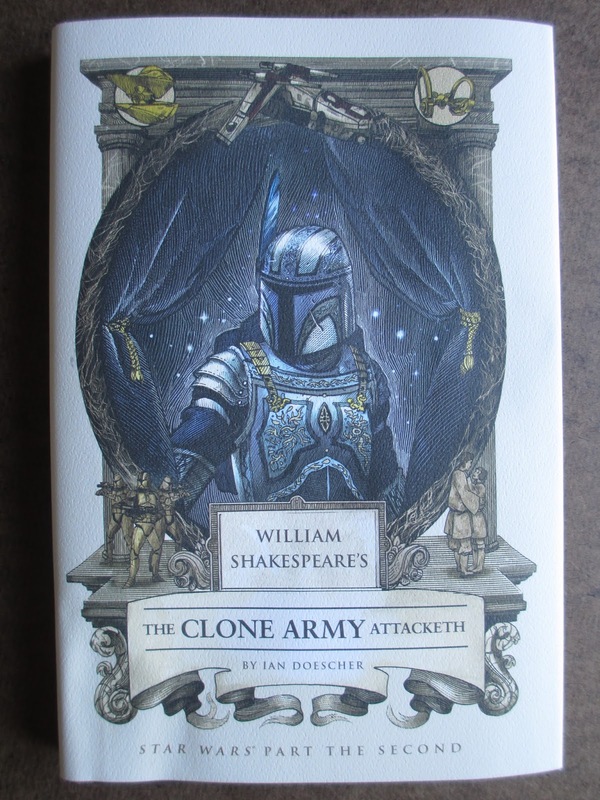 Wow, are we already on the fifth installment, The Clone Army Attacketh, in the Shakespeare's Star Wars series? It's all flowing along so easily and simply now, like it was all meant to be. First we have Anakin and Padme's scenes together. 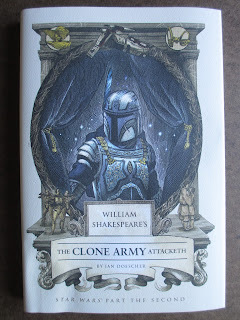 They run more quickly in Ian Doescher's retelling and the dialogue, while still essentially the same, is much improved: a certain kind of sappiness is okay in Shakespeare language because it is more pristine and it is intentionally moved to a higher dramatic and poetic sphere than regular life. So what sometimes came off awkwardly in the movie came off rather lovely in its Shakespeare-ization. All of the politics are condensed, too, so that you get the theme and all of its importance before you get all the little details about voting and government loyalties and such. Makes for great readability and, again, easy taking in of the overall theme. One of the nicest scenes in the movie is when Anakin is riding out to find the Tusken Raiders: the colors and the music and the black cloak and the determined fury in his eye. And it was portrayed just wonderfully in words--that's the heart of tragedy right there. As far as Nicholas Delort's illustrations, my favorites this time were the one of Taun We and the one of Anakin and Padme on Naboo. The sprinkling of Shakespeare quotes and references tends to be more subtle now--and is somehow even more satisfying now being that it's this way. So even though it's a half ridiculous idea to have a Shakespeare-ization of all six episodes (or perhaps because it is), I am still thoroughly enjoying this ride. Ah, Disneyland, you know me so well. You know that which will delight my heart. For the 60th Anniversary, what special something did you have on offer, just for me? Truffles. And not just one but three separate boxes of them, too. Ah, I am delighted. I heard about these truffles not long before I found out also that I would be able to visit the parks in late July. So even though each box comes with a $16.99 price tag before taxes, I made my plans to get all three. Each box is designed for one of the restaurants around the resort: Steakhouse 55 in the Disneyland Hotel, the Blue Bayou in Disneyland, and Carthay Circle in Disney California Adventure. Initially, you were supposed to be dining at the restaurant to purchase the truffles but they quickly opened that up to allow everyone to buy them, regardless of whether you're eating at the restaurant. It is my tradition to spend the evening before the park day(s) in Downtown Disney, walking around and shopping at World of Disney and having dinner somewhere there. So I made a stroll over to the Disneyland Hotel and spent some time in the lobby looking over their lovely giant map of Disneyland, and then headed over to the Steakhouse 55 entrance. I asked the hostess about the truffles; she was friendly and let me know that I could buy them from the waiters or the in the lounge. So I went up to the bartender and he brought a box out for me; he was also nice, telling me about how I was the first one to buy a box that day. That somewhat surprised me: given how excited I was for these truffles, I would have thought everyone else would be, too. Here was where I ran into the unexpected: when you pay, you realize that your receipt looks exactly like it would if you were dining at the restaurant or having a drink in the lounge. That is, there is a space for a tip. Feeling generous (since I was around Disneyland), I thought I'd rather give a small tip than not give anything, even if perhaps not everyone tips when they're just picking up a box of truffles on the go. You'll also want to note that I did have to wait a few minutes from the time I arrived to when I left; so plan on taking your time and enjoying your surroundings, even if you're not dining in. Which, by the way, if you would like some nice dining, I do very much recommend Steakhouse 55, where I once ate for my birthday: it's a quiet, luxurious, and lesser-known corner with good food and service. I just had no plans to eat there (or at either of the two other restaurants with truffles) on this particular trip. The truffles come in sets of four in small, rectangular boxes of roughly 2.5 inches by 6 inches. Classic Disney blue with a simple decoration of Sleeping Beauty Castle with a star soaring over it and the Diamond Celebration announcement make for something of a souvenir box. I was so happy with my little box that I had to hold it in my hands for a few minutes before stowing it safely away in a bag (the one I already had from World of Disney). A clear, circular sticker on each end of the box keeps it shut without ruining the look of the box. Underneath the lid you'll find a glossy paper with the Diamond Celebration logo in one corner, the Steakhouse 55 logo in the other, and images and descriptions of the four truffles in the center. The flavors are different for the different restaurants and are inspired by drinks or desserts associated with each restaurant. 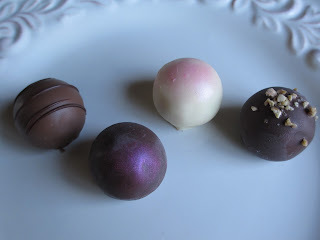 My truffles had a slight look of age about them, just the barest hint at bloom on the surfaces--perhaps they just weren't kept at the right temperature? (And this wasn't my fault this time: I peeked inside the box right away.) Otherwise they look nice in a clear plastic setting, inside their little chocolate papers. On the left we have the Kahlua truffle, which is described thus: "Coffee, brown sugar, vanilla." It has a milk chocolate shell with some darker chocolate stripes and a dark ganache center. You can definitely taste the coffee and sugar right away, with only a very slight alcoholic taste; it does have the flavor of Kahlua. The vanilla is in there, too. The milk chocolate makes the right base for these flavors, though I didn't get the chance to taste it much on its own. Simply for the profile of flavors, this truffle was pretty good. It was probably a tad sweet and not quite on par with its price tag (which I was expecting, anyway), but it was still very enjoyable. It might be my favorite of the four. Next we have the Cosmopolitan, which has "Vodka, triplesec, cranberry juice, lime." It's white with a swirl of pink on top and a white ganache center. There is more of a bite to this truffle, what with the flavors of alcohol and lime, yet it is also very creamy from all of the white chocolate. The effect is like a citrus dessert, except that it isn't just the flavor of citrus that gives the sting here. I'm not generally into tangy chocolates (or desserts), so I did enjoy this one more than I generally like citrus chocolates. I would say that owes to how much the white chocolate balanced out the tang. Coming in third is the Primitivo: "Fruit flavors, raspberry, blackberry, cherry, plums, and raisin." It appears to have a dark chocolate shell, with a swirl of magenta color on top and a dark ganache center. Here is the order that I tasted all of the flavors: blackberry, raisin, cherry, raspberry, plums; I was impressed that I did taste each of these, in quick succession yet still individually. They're all woven in quite nicely, each with their own moments even while they blend together like a rich fruit jam. Again, I can't taste the chocolate itself much: it's just a base for the very pronounced added flavors. Still a tad sweet for a truffle--but otherwise rather good and one of my favorites from the set. Last is the 24 Layer Chocolate Cake: "Milk chocolate, hazelnut, and a hint of vanilla." This chocolate appeared slightly darker than that of the Kahlua truffle; it's topped off with little bits of hazelnut. Probably I would call this truffle the most disappointing of the lot. It began alright. I was tasting the nuttiness along with the chocolate and it was very nice, like a warm dessert, but then I suddenly got a weird, artificial or stale flavor. It must be the vanilla. Granted, it didn't taste quite so weird on a second tasting, but was still very disappointing. I love chocolate and hazelnut together and I love good vanilla (it's great in tea), but there was just something here that didn't come over right. It tastes like a mediocre ingredient to me. The truffle was okay--but I'd call it the weak one out of the four. Call me pessimistic, but I wasn't expecting much from these truffles, as excited as I got over them. 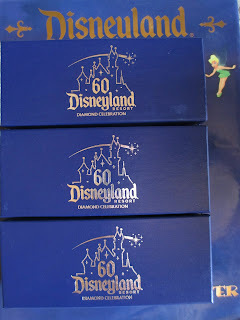 I was simply excited over the idea of them and the fact that I'd get to keep the boxes forever and I'd get to review Disneyland truffles. But, you know, I think these truffles were good. Yes, they seem fairly mass-produced and they are overpriced (but what Disney food isn't?). But they were a lot of fun to buy and to try and to bring home with me. And the flavor profiles were pretty good: overall, it appeared a lot of thought went into what flavors should be portrayed and in what balance they should all appear. So with the Kahlua and Primitivo truffles as my favorites, I'll approve of the Steakhouse 55 box. Next up will be the Blue Bayou. Click here for my review of the second box, from Blue Bayou, and here for the third box, from Carthay Circle. They're necessary, yes--but does it really help to read a book's summary before you read the book itself? You have to know something general about a book to know whether you might or might not like it, or at least whether or not you might find it worth reading. So you generally must at least glance at the summary. But it can be quite often that I find myself not in need of the summaries--or wishing they weren't even there. This is for different reasons. 1) The book is a sequel - If I like a book and it has sequels either already out or coming out, I will most likely read them because otherwise I feel like I haven't finished something. So I don't need the summary because I'm going to read the book, anyway, and looking at the summary might just spoil a surprise plot element. 2) The book is from an author I'm loyal to - I'm loyal to an author for different reasons. I watch a couple of YouTube authors, and so I feel loyalty to read all their new books just because I feel like it's my way of paying them back for their videos that I enjoy--and because it's curious to see what kind of books the people who make these videos are writing. Or maybe it's an author I've just really enjoyed and want to continue reading more of: these might either be the further works of a dead author or the newly published works of a living author. Either way, just the author's name has me interested. 3) The book comes under recommendation - Recommendations can be personal, or maybe a book is just a title you've been hearing a lot about and want to investigate for yourself. Like Wicked: I've heard a lot about it but I'm not sure I've ever actually read the summary and yet I'm beginning to think I might like to read it one of these days, just to see what people like so much about it. 4) The book is a story I already know - Mainly this covers books that have been made into movies, but can also be classics or other stories that are basic knowledge. I already know the story so, even though I haven't read it yet, I don't need to see a summary. 5) The book has other factors going for it - Sometimes you take time to browse a bookstore and you jut come across random things that look good. A title catches your eye, or a book cover--something about the tone that interests you. You can turn to the summary to learn more, or you can just flip to a few of the pages inside and read a couple of sentences, get a feel for the author's style. It's amazing how much more you can grasp sometimes by doing this instead of looking at the summary. Granted, you'll usually want to look at the summary, too, but not every time. It's very freeing, in fact, to not read a book's summary beforehand. In cases 2-3, I usually at least glance at the summary (to make sure that it doesn't sound like something completely out of my scope of interest) when I buy the book--but then I sometimes purposely let the book sit on the shelf for long enough that I've half forgotten the summary. That way, when I finally pick it up, it will be new to me, every little detail of plot, character, and setting will be new and my reactions can come to me with the turning of each page. Freeing, yes, that's what it is. I ramble all the time on this blog, but I don't often rant. So you'll have to forgive me today: I feel the need to rant a little. It's about YA, that topic of conversation that can bring about so many sub-topics. You see, I had been thinking about this "problem" of sorts that I have with YA, and then I came across something (in real life) that made me feel even more frustrated (if that's the word) with this "problem." I put "problem" into quotes because maybe it isn't a problem and it really has nothing to do with anything and I'm just being old in even noticing it or wondering about it. So that's why I call this post a rant and ask you to forgive me. Now, I read across different genres because genre doesn't really matter to me: I tend to like the books that are less tied to one genre and therefore I'll pick up any book that looks good no matter what genre it's in (romance and mystery are the two genres, however, that I never seem to dip into--they're more acquired/specific tastes, aren't they?). So even though it seems like most of the twenty somethings these days mainly read YA, I don't read that much YA--and I didn't read that much YA even when I was the target age for YA. These days in YA I mainly just read Stephenie Meyer, Gayle Forman, and Robyn Schneider; at around 12-15 years, I think the only YA author I really read was Ann Rinaldi (and she wrote historical fiction). What I'm getting at is the fact that YA is, supposedly, a genre about teens for teens. Yes, many other age groups read YA and therefore it isn't really just a genre for teens anymore, whether or not it ever was. And no, I'm not suggesting that books lie and say that teens don't even drink or do drugs or make bad decisions, and I'm not calling for censorship or morality tales. Not any of that. I just wonder. I feel like, no wonder some people might have trouble and feel like, oh, getting drunk is completely normal because even the teen books that are written by adults portray it as just a part of life (is it because they're forgetting they're writing for and about teens? or is it because they feel like they're just representing teens as real people?). If you want to get drunk, you're putting yourself into a a situation of possible (and probable) irresponsibility and therefore you need to be responsible about when/how you get drunk. Or even drink, for that matter. The whole under-21 issue aside (which is definitely a real issue), you need to be aware of all this--but since it's completely illegal for teens to drink, it's harder for them to "drink responsibly" (if you're old enough to have your own house, you can get wasted in your own house, or otherwise as an adult you can still go out to a restaurant or bar or club or wherever and have your designated driver). So I wonder why the teen books (no, not all of them, and not all the time) just sprinkle in what I would call irresponsible behavior as casually as they would describe going out to the movies or having a few sodas. This is just a rant. I have no main message or theme. It's just my wonderings about this concept. Again, I'm not saying that I want this genre to be all about "teaching morals to the young ones." But I do think that fiction has the ability to help people figure out how to live their lives--and sometimes the way to do that is to show how bad decisions can have bad outcomes, or how a little responsibility can go a long way. Characters have to be realistic, yes, and therefore they also have to be flawed, but do we really need to show so much of certain flaws? It's like you get all the anti-drug programs in elementary school and then all the pro-alcohol fiction in high school (no, I'm not saying drugs and alcohol are equal; but getting drunk irresponsibly is pretty much on the same lines as drugs). So there's my issue. Bye, I'm done. I'll say nothing more, I promise. As I was referencing before I left, I just spent some time in California, mainly around Anaheim and the San Diego-ish area. While out there I bought tea, chocolate, wood (I'll explain when I do my August Favorites), Disney pins, more tea, and more chocolate. I thought I hadn't been buying much chocolate, but when it was all over I counted three (4-piece) boxes of truffles, four chocolate bars, various candies with chocolate in them, and these Rose Petal Savories. I plan to review everything except for the candies (some of which I have already eaten and none of which I would have much to say about). I'm starting with the simplest and most casual, which also happens to be from one of my favorite stores in San Diego. The Historic Old Town District is a beautiful area with old buildings that now house different types of stores. I like the candy store and the main museum store and one corner of the Marketplace store and the Rust General Store. If you love old things and food and old-looking food (that sounds bad . . .) and good food products, you'll love this store. They have a good chocolate selection, some nice candies and mints, lots of sauces and spices, local soaps, honey, and that sort of thing. And they're one of the most historical-looking stores even in the historic district. I get so excited in there that I literally don't know the price of these savories: they weren't marked and I didn't ask when I paid (I had a lot of things and I figured they wouldn't be more than $15 and would therefore be low enough that I would be willing to pay for them). Certainly you've gathered by now that I'm fond of rose as a scent and as a flavor. So while this style of chocolate candy doesn't interest me as much as a plain chocolate bar I've never tried before, the fact that one of the flavors for sale was rose petal had me. And, you know, it makes more sense to buy something like this at a store like that, too: while rose is still used as a flavor, it isn't used as often (in the U.S. at least) as it once was. Kind of a shame, really: rose is so soft and ladylike, floral but also almost fruity. The clear plastic box (which is really more like a pouch than a box) could be more interesting looking but it serves its purpose and has a handy top that opens and closes easily--being someone who doesn't like to eat a chocolate or candy all in one sitting, I appreciate the ability to close a package again after opening. The pouch is about 5 by 3.5 inches and so is able to hold many little chocolate circles. 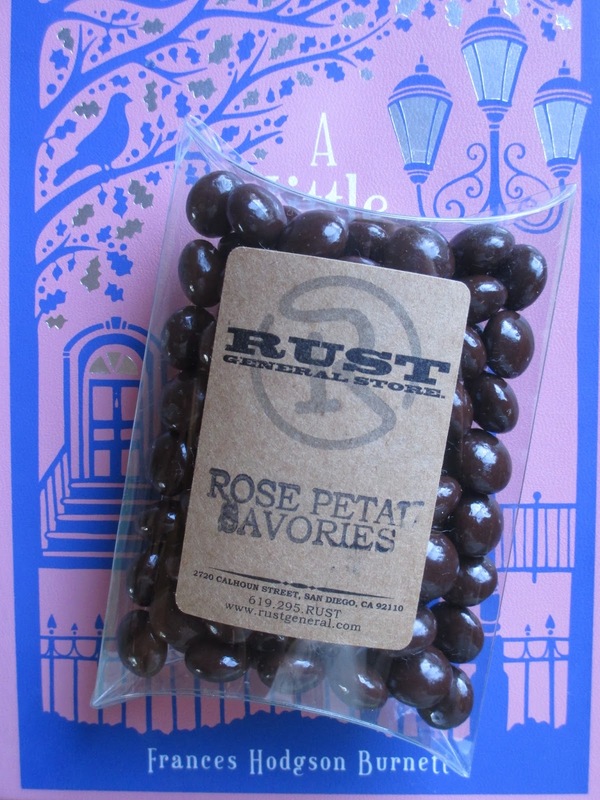 Coated thinly in shine, the savories are a light dark chocolate with a full rose petal flavor. The rose is as a strong as a bite of Turkish Delight and has the flavor of rose water (as opposed to other possible "rose" flavors). Dark enough to form a base for the rose flavor, the chocolate still steps back to let the rose take center stage, and that's the right way for it to be. I like them best two or three at a time, truly as "savories" and not so much as candies. They're not quite truffles--but maybe they're something like after dinner mints: little tidbits of full flavor to enjoy in small doses in quiet moments. They'd be perfect for putting in a mint tin to keep in your purse, or just for keeping in your desk (my favorite place for both candy and chocolate).